The Bootleg Series Vol. 11: The Basement Tapes Complete is a compilation album of unreleased home recordings made in 1967 by Bob Dylan and the group of musicians that would become The Band, released on Legacy Records November 3, 2014. It is the ninth installment of the Bob Dylan Bootleg Series, available in the six-disc complete set and a two-disc set common to the rest of the series entitled The Basement Tapes Raw. Revered for decades as the "holy grail" for music collectors and Dylan fans, the recordings have been notoriously bootlegged by collectors in various forms throughout the years, the first being arguably the first rock bootleg album, the Great White Wonder, released in July 1969. The Basement Tapes Complete is the first time the complete sessions, containing 138 tracks of which 117 were not previously issued, have been officially released. Of these tracks 23 are alternate takes, making 115 distinct songs in the set of which some heard in two or three different takes. The Basement Tapes Complete was universally acclaimed upon release by critics and fans alike, and went on to win Best Historical Album at the 58th Annual Grammy Awards. The liner notes for The Bootleg Series Vol. 11 are by Sid Griffin, American musician and author of Million Dollar Bash: Bob Dylan, The Band, and The Basement Tapes. The basement recordings were made during 1967, after Dylan had withdrawn to his Woodstock home in the aftermath of a motorcycle accident on July 29, 1966. Recording sessions began in a den known as "The Red Room" in Dylan's home, before moving to an improvised recording studio in the basement of a house known as Big Pink, where Rick Danko, Richard Manuel and Garth Hudson lived. The sessions lasted roughly from May to October 1967. In October 1967, a fourteen-song demo tape was copyrighted and the compositions were registered with Dwarf Music, a publishing company jointly owned by Dylan and his manager Albert Grossman. Acetates and tapes of the songs then circulated among interested recording artists. [a 1] Dylan has referred to commercial pressures behind the basement recordings in a 1969 interview with Rolling Stone: "They weren't demos for myself, they were demos of the songs. I was being PUSHED again into coming up with some songs. You know how those things go." Peter, Paul and Mary had the first hit with a basement composition when their cover of "Too Much of Nothing" reached number 35 on the Billboard chart in late 1967. Ian & Sylvia, also managed by Grossman, recorded "Tears of Rage", "Quinn the Eskimo" and "This Wheel's on Fire". In January 1968, Manfred Mann reached number one on the UK pop chart with their recording of "The Mighty Quinn". In April, "This Wheel's on Fire", recorded by Julie Driscoll, Brian Auger and the Trinity, hit number five on the UK chart. That same month, a version of "You Ain't Goin' Nowhere" by the Byrds was issued as a single. Along with "Nothing Was Delivered", it appeared on their country-rock album Sweetheart of the Rodeo, released in August. The Hawks, officially renamed the Band,[a 2] recorded "This Wheel's on Fire", "I Shall Be Released" and "Tears of Rage" for their debut album, Music from Big Pink, released in July 1968. Fairport Convention covered "Million Dollar Bash" on their 1969 album Unhalfbricking. In July 1969, the first rock bootleg appeared in California, entitled Great White Wonder. The double album consisted of seven songs from the Woodstock basement sessions, plus some early recordings Dylan had made in Minneapolis in December 1961 and one track recorded from The Johnny Cash Show. One of those responsible for the bootleg, identified only as Patrick, talked to Rolling Stone: "Dylan is a heavy talent and he's got all those songs nobody's ever heard. We thought we'd take it upon ourselves to make this music available." The process of bootlegging Dylan's work would eventually see the illegal release of hundreds of live and studio recordings, and lead the Recording Industry Association of America to describe Dylan as the most bootlegged artist in the history of the music industry. The basement recordings became the basis for Dylan's 1975 official release The Basement Tapes. This album was criticised by Dylan critic Michael Gray because it contained recordings by the Band on their own, and because important Dylan songs were omitted from the selection. Subsequent to the official 1975 release, more than 100 recordings from the Basement Tapes began to circulate in bootleg form, catalogued by Greil Marcus in his book Invisible Republic: Bob Dylan's Basement Tapes (1997), and by Sid Griffin in Million Dollar Bash: Bob Dylan, the Band, and the Basement Tapes (2007). The Bootleg Series Vol. 11: The Basement Tapes Complete presents the original recordings, and places them in roughly chronological order. The original reel-to-reel tapes were in the possession of Garth Hudson, organist for the Hawks. He brought them to fellow-Canadians, Jan Haust and Peter J. Moore who restored and digitized them for this release. Their work led them to be nominated in 2016 for a Grammy award for Best Historical Album. The Bootleg Series Vol. 11: The Basement Tapes Complete received unanimously positive reviews from critics. The critical aggregator website Metacritic awarded The Basement Tapes Complete a Metascore of 99, based on reviews by 18 critics, indicating "universal acclaim". Writing for AllMusic, Stephen Thomas Erlewine gave it five out of five stars, writing, "This is the wondrous thing about The Basement Tapes: this is music made with no expectation that anybody outside of a small circle would ever hear it." Paste magazine rated the album ten out of ten, and called it "some of the most daring, creative and truly beautiful music ever recorded". Music fans having access to the complete archives of The Basement Tapes is somewhat akin to historians being presented with the tapes of the meetings of the Continental Congress or art buffs who receive a videotape of Da Vinci's entire process of painting The Last Supper." Discussing the song "I'm Not There", Jesse Jarnow said that "Here and everywhere, underscored by the newest remix, The Basement Tapes are almost purely beautiful — a characteristic not often associated with Dylan’s music." Not all critics, however, were entirely pleased with the overwhelming completeness of the album, and considered a large amount of the album consisted of throwaway songs that were never meant to be heard. In his review for The New Yorker magazine, Sasha Frere-Jones wrote, "Historically, these sessions have been treated with awe, as if something essential about both Dylan and popular song can be found on the tapes. That's at best half true. The performances weren't approached with any kind of gravity, and are best listened to with no reverence at all. For every moment of revelation and synthesis, there are five throwaways." All songs written by Bob Dylan except where noted; traditional songs arranged by Dylan. Released alongside the "Complete" set is a two-disc collection of highlights. ^ The songs on the demo were: "Million Dollar Bash", "Yea! Heavy and a Bottle of Bread", "Please Mrs. Henry", "Down in the Flood", "Lo and Behold", "Tiny Montgomery", "This Wheel's on Fire", "You Ain't Goin' Nowhere", "I Shall Be Released", "Tears of Rage", "Too Much of Nothing", "The Mighty Quinn", "Open the Door, Homer" and "Nothing Was Delivered" (Griffin 2007, pp. 229–230). ^ When Albert Grossman was shopping around for a recording contract for the Hawks in late 1967, the group instructed him to sign them under the name the Crackers—a derogatory term for poor white Southerners. The band also mischievously dubbed themselves the Honkies. It was only when Helm joined them in Woodstock that they settled on calling themselves the Band (Hoskyns 1993, pp. 143–144). ^ The attribution of "Be Careful of Stones That You Throw" to Benjamin Lee Blankenship has been questioned. ( Fraser, Alan. ""Searching For A Gem": The Bootleg Series Vol. 11 – The Basement Tapes Raw/Complete". ) Both Sid Griffin's Million Dollar Bash: Bob Dylan, The Band, and the Basement Tapes (Griffin 2007, p. 130) and Derek Barker's The Songs He Didn't Write: Bob Dylan Under The Influence (Barker 2008, p. 33) write the song was written by Bonnie Dodd; it was first released by Little Jimmy Dickens in 1949, and was a hit for Hank Williams, performing as Luke The Drifter, in 1952. ^ "Bob Dylan and the Holy Grail: Basement Tapes Officially Released After 47 Years". Highbrowmagazine.com. Retrieved 2016-06-11. ^ "40 Years Ago: Bob Dylan and the Band's 'Basement Tapes' Finally Gets an Official Release". Ultimateclassicrock.com. 2015-06-26. Retrieved 2016-06-11. ^ Eric Harvey (2012-09-12). "Bob Dylan's Great White Wonder: The Story of the World's First Album Leak". Pitchfork.com. Retrieved 2016-06-11. ^ "Bob Dylan Wins a 2016 Grammy Award | The Official Bob Dylan Site". Bobdylan.com. 2016-02-01. Retrieved 2016-06-11. ^ a b Greene, Andy (August 26, 2014). "Bob Dylan's Complete, Legendary 'Basement Tapes' Will Be Released". Rollingstone.com. Retrieved October 29, 2014. ^ Rollins, Ben (November 1, 2014). "The Basement Tapes Track-by-Track". bobdylan.com. Archived from the original on December 5, 2014. Retrieved November 24, 2014. ^ Griffin 2007, p. 228. Capitals as printed in original interview. ^ Gilliland 1969, show 54, track 3. ^ Griffin, Sid (2007). Million Dollar Bash: Bob Dylan, the Band, and the Basement Tapes. Jawbone. ISBN 1-906002-05-3. ^ David Friend (2016-02-17). "Bob Dylan's restored 'Basement Tapes' give Toronto duo Grammy attention | Toronto Star". Thestar.com. Retrieved 2016-06-11. ^ "The Bootleg Series Vol. 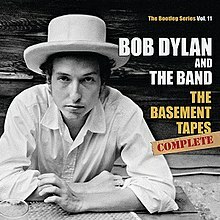 11: The Basement Tapes Complete Reviews". Metacritic.com. Retrieved April 26, 2016. ^ Stephen Thomas Erlewine (2014-11-03). "The Bootleg Series, Vol. 11: The Basement Tapes – Complete – Bob Dylan,The Band | Songs, Reviews, Credits". AllMusic. Retrieved 2016-06-11. ^ Beviglia, Jim (2014-10-31). "Bob Dylan & The Band: The Basement Tapes Complete « American Songwriter". Americansongwriter.com. Retrieved 2016-06-11. ^ Scott Schinder (2014-12-12). "Review: Bob Dylan & The Band – Music". The Austin Chronicle. Retrieved 2016-06-11. ^ Mills, Fred (2014-11-04). "BOB DYLAN AND THE BAND – The Basement Tapes Complete – Blurt Magazine". Blurtonline.com. Retrieved 2016-06-11. ^ Kaye, Ben (2014-11-06). "Bob Dylan and the Band – The Basement Tapes Raw: The Bootleg Series Vol. 11 | Album Reviews". Consequence of Sound. Retrieved 2016-06-11. ^ Alexis Petridis. "Bob Dylan and the Band: The Basement Tapes Complete review – rickety, strange and utterly timeless | Music". The Guardian. Retrieved 2016-06-11. ^ Simmons, Michael (2014-11-03). "Bob Dylan's Complete Basement Tapes: Read MOJO's Review". Mojo4music.com. Retrieved 2016-06-11. ^ "Bob Dylan and The Band: The Basement Tapes Complete Review :: Music :: Reviews :: Paste". Pastemagazine.com. Retrieved 2016-06-11. ^ Fricke, David (2014-11-05). "Bob Dylan The Basement Tapes Complete: The Bootleg Series Vol. 11 Album Review". Rolling Stone. Retrieved 2016-06-11. ^ Wojtas, Michael. "Bob Dylan: The Basement Tapes Complete: The Bootleg Series Vol. 11 (Columbia/Legacy) Review | Under the Radar – Music Magazine". Undertheradarmag.com. Retrieved 2016-06-11. ^ "The Basement Tapes Complete: The Bootleg Series Vol. 11". metacritic.com. Retrieved November 26, 2014. ^ Erlewine, Stephen (November 3, 2014). "The Basement Tapes Complete: The Bootleg Series Vol. 11". allmusic.com. Retrieved December 1, 2014. ^ Jesse Jarnow "Secrets For Sale: Bob Dylan’s ‘Basement Tapes’ Maintain Their Mystery Despite Complete Release"
Barker, Derek (2008). Bob Dylan: The Songs He Didn't Write: Bob Dylan Under the Influence. Chrome Dreams. ISBN 978-1-84240-424-9. Gilliland, John (1969). "Hail, Hail, Rock 'n' Roll: Getting back to rock's funky, essential essence" (audio). Pop Chronicles. University of North Texas Libraries. Gray, Michael (2000). Song & Dance Man III. Continuum. ISBN 0-8264-5150-0. Griffin, Sid (2007). Million Dollar Bash: Bob Dylan, the Band, and the Basement Tapes. Jawbone. ISBN 1-906002-05-3. Hoskyns, Barney (1993). Across The Great Divide: The Band and America. Viking. ISBN 0-670-84144-7. Marcus, Greil (1997). Invisible Republic: Bob Dylan's Basement Tapes. Picador. ISBN 0-330-33624-X. Scherman, Tony (July 29, 2006). "The Bob Dylan Motorcycle-Crash Mystery". American Heritage. Archived from the original on November 6, 2006. Retrieved June 18, 2014. Roberts, David (1999). Guinness British Hit Singles. Guinness Publishing. ISBN 0-85112-092-X. Sounes, Howard (2001). Down the Highway: The Life of Bob Dylan. Grove Press. ISBN 0-8021-1686-8. Whitburn, Joel (2004). The Billboard Book of Top 40 Hits (8th ed.). Billboard Books. ISBN 0-8230-7499-4. BobDylan.com – Official web site, including lyrics and touring schedule. Bob Dylan 1967 recording sessions at Olof Björner's website.